The Thanksgiving feast is the most anticipated meal of the year. That can mean a lot of pressure if you're the one in charge of deciding what to offer. Some people are all about innovation -- tofu, teriyaki, you name it -- someone has tried it on Thanksgiving. Others are all about tradition and those are our kind of people! This year, look back to the past for some interesting menu ideas that may not be common at modern Thanksgiving tables. This way you can serve something unique and revive an old tradition. When the original Pilgrims at Plymouth Plantation decided to have a three day feast to celebrate a successful harvest in 1621, they had no idea they were initiating what many people view as the first ever Thanksgiving. The 53 remaining passengers from the Mayflower (49 out of the original 102 had died) hosted about 90 Native Americans in a joint harvest celebration. Wild fowl: There were many birds available to eat in the New World. The Pilgrims likely had a combination of wild turkey, goose, duck or even passenger pigeons -- a now extinct smaller bird that used to roam the U.S. in biblical sized flocks. Venison: The Native Americans went out and killed five deer, which they brought back to the plantation to cook. Corn: Corn was probably the most plentiful non-meat dish at the feast. It was likely made into bread or porridge, and of course eaten in its vegetable form. Eels: The Native Americans taught the Pilgrims how to catch eel (plentiful on the New England coast) early on in their relationship, so these sea creatures had a likely surprising (to the modern eye) presence at the feast. Beer or wine: If the Pilgrims had any beer with them, it was likely only a small amount. Most likely the only drink available at this Thanksgiving was water. Pies or pastries: The Pilgrims didn't have butter or wheat flour to make the crusts for pies and pastries. Potatoes, of any kind: At this point, neither white potatoes nor sweet potatoes had made their way up to North America from South America, where they were first cultivated. Cranberry sauce: Can you believe it!? The sad fact is cranberry sauce wouldn't be "discovered" for another 50 years! Thanks to a preserved letter from Juliana Smith to her cousin Betsey, written in 1779, we have an idea of what at least one Thanksgiving during the Revolutionary War was like. The family gathered at Uncle Simeon's house and helped with the preparation, which took three days! Dessert: Pumpkin pie, apple turnovers, plumb pudding, "Indian pudding"
Our country, ever mindful of its suffering army, opened her sympathizing heart so wide, upon this occasion, as to give us something to make the world stare.. a half a gill of rice, and a table spoon full of vinegar!! 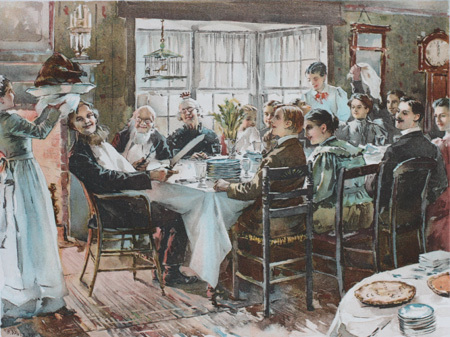 Prior to 1863, there was no widely accepted date that Thanksgiving took place on. Traditionally, the Governor of each state would annually issue a proclamation designating a single day as the day of Thanksgiving. Some states would celebrate as early as October, others late as January, and some not at all -- especially in the South. One woman -- Sarah Josepha Hale, editor of a popular women's magazine Godey's Lady's Book -- set about to change this by campaigning for Thanksgiving to be made a national holiday. Over the course of the 19th century, she wrote five Presidents with this idea and finally convinced Abraham Lincoln to establish Thanksgiving as a national holiday in 1863. Wanting to continue his theme of uniting America as one heart and mind, he issued a "Proclamation of Thanksgiving" setting apart the last Thursday of November for the holiday. 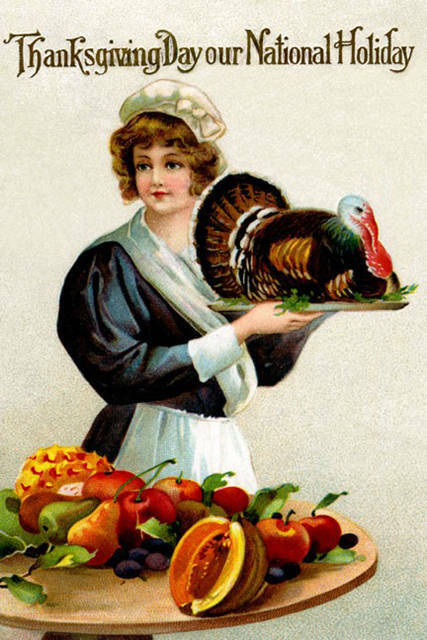 Coincidentally (or not so coincidentally), Sarah Josepha Hale really benefited from this tradition -- throughout the decades of her campaign, she had been publishing Thanksgiving cook books and articles in her magazine, planting recipe ideas in the heads of women all over America. Once the day finally became official, everyone knew exactly who to turn to for Thanksgiving recipes, many of which are still staples today. Whatever you decide to serve your family this Thanksgiving, the most important thing is that you're all together. This annual gathering is the perfect time to begin a conversation about family history. Get some research started today and have something to show off and discuss this holiday season!